I distinctly remember thinking, “Oh, it will be such a nice to change to not have to play organ for mass anymore, and to be able to just sing!” upon leaving home in August. 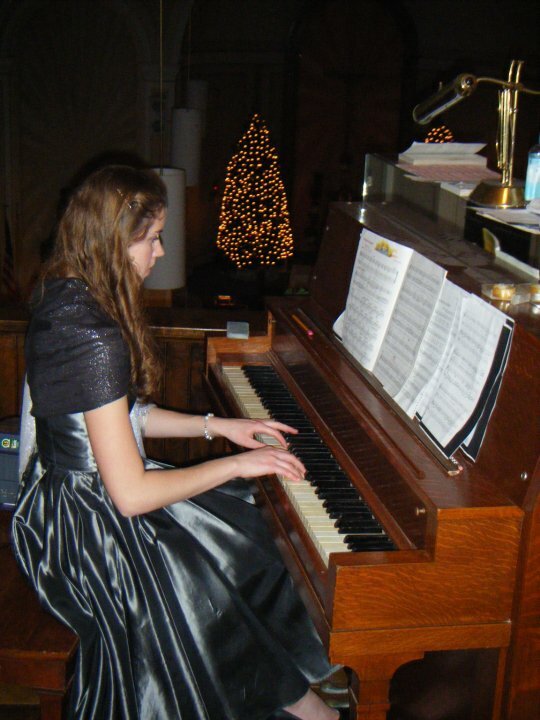 I have been playing the organ for Sunday mass at the “Jewel on the Ridge”, St. Peter’s Parish Church since I was 14. And while I do admit that it was the best job in the world, I was looking forward to a change. It takes a lot of concentration to accompany a mass, and I never was able to just sink into the beautiful rhythm of the words and form of the mass, always waiting for a cue, signaling the start to the Alleluia, Sanctus, or the communion hymn. So, it came as a big surprise even to me when I heard the words slip out of my mouth, volunteering to play organ for mass at the Dominican priory here on campus. It was a natural reaction to the situation. My brothers, Raphael and Patrick, had invited to me to go to mass with them that Sunday. The mass took place in a large room, complete with a lecturn, alter, and to my surprise, an organ in the far back corner. Windows dot the wall behind the alter, letting in little bits of the Dallas skyline, set into plain, stone walls . In other words, it was the complete opposite of St. Peter’s. Except for that organ. The priest who does the mass normally is 97 years old, and there was no music. What could I do? I went up to the priest after mass and volunteered with Emma, who is now doing all the cantoring with me. The familiar pattern of Sundays in now back in place for me: get up, pick out music (typically I call Mom for this-we have the same book here as back home), practice, and walk over to mass. Now of course I have to walk much farther than across the road, and the way is so much different, studded with small, twisted trees and sidewalks, in place of oaks and maples, and grass and gravel scraping my Sunday heels. But at least I’ve found some equilibrium. I’m back on the bench, and here to stay. This entry was posted in Colleen and tagged Catholic, College, Dallas, Music on October 18, 2011 by sweetridgesisters.